If you purchased WipeDrive from any location other than our website, it may have the SystemSaver feature included on the CD. After running the SystemSaver setup, you are asked to restart your computer. When your computer reboots, it may be set to read from the CD first instead of the hard drive. This is an uncommon setting on your computer and should be corrected as soon as you get the chance. If the system boots from the CD instead of the hard drive, it will load WipeDrive first. 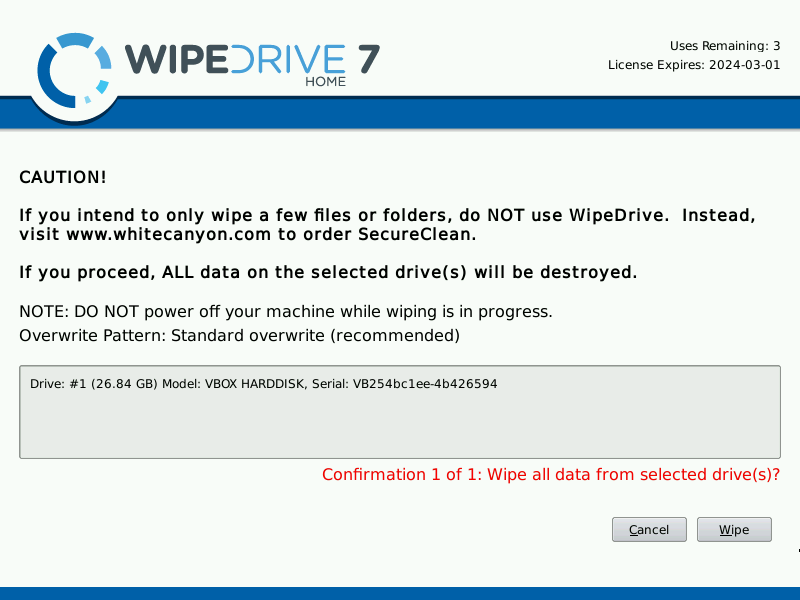 This software is intended to erase ALL data on the computer, including the OS. There is, however, one last confirmation page before continuing. The image below shows this confirmation. In this day and age, End User License Agreements and Confirmation pages full of text can be ignored pretty easily, so if your computer no longer has an OS after beginning the SystemSaver process, it may be because this screen was passed by. If this is the case, you will need to re-install Windows using a full and complete Windows disc manually. 1) Make sure your computer is set to read from the hard drive before the CD-ROM drive. 2) Remove the CD as the computer reboots. 3) Make sure to click Cancel if you see this confirmation screen and you do not want to wipe all of the data.